Pond Inspections VISIT OUR SHOWROOM! We offer full service pond inspection that serves customers all over Southern California. Our main areas of service are detailed below. No, it’s not one of those sea creatures from “Pirates of the Caribbean”. 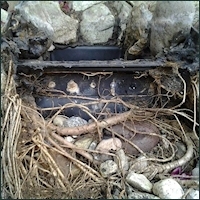 What you are looking at here are roots from trees and plants that got behind the pond liner at the waterfall box. The galvanized hardware that was supplied by “The Aquascape Co.” had dissolved and the unsuspecting homeowner had a leak for years and didn’t even know it!!! If you have a pond with an “Aquascape” Filter System, there’s a really good chance that your pond may be leaking too, and costing you hundreds of dollars a year! Call today for your FREE “Pond Inspection” and do your part in going green. Who knows, you might be helping to save the environment and your wallet!